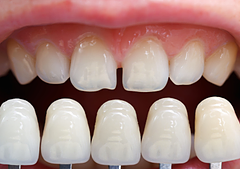 Veneers are Ceramic (usually porcelain) or other composite resin-based ultra-thin shells, which are applied to the front of the patient’s teeth. The simplicity of the procedure involved means that it is not only cheap to undergo, but requires little or no anaesthesia to perform. Composite veneers are a restoration that is a cost effective and often reversible way to achieve a cosmetic result. They are directly built up by the dentist out of composite resin and have the advantage that they can be easily modified or added to. While not as durable as porcelain, they can be very functional and aesthetic, and may be used as a diagnostic or intermediary step before porcelain veneers or crowns.